Mel Gibson's planned collaboration with "Basic Instinct" screenwriter Joe Eszterhas on a historical drama about Jewish warrior Judah Maccabee has been put on hold after Warner Bros. decided it was not ready to film the current script, the studio said Wednesday. 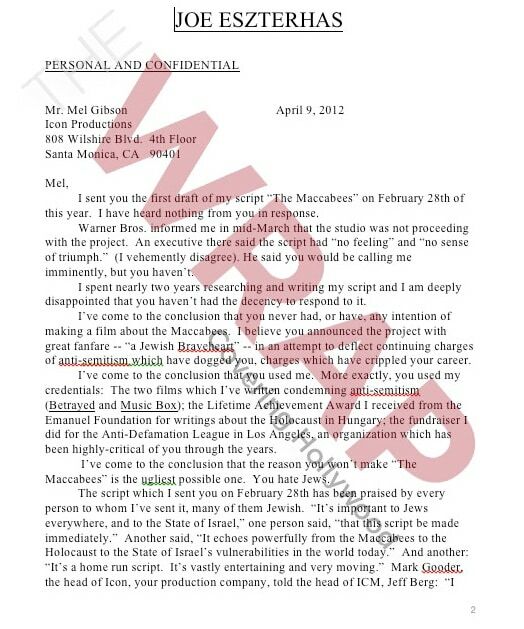 Gibson, who went on an anti-semitic rant when he was arrested for driving under the influence in 2006 and was criticized for depicting Jews negatively in 2004's "The Passion of the Christ," was to produce and potentially direct but not star in the Maccabee film. He will likely instead direct but not star in a movie about the Vikings written by Randall Wallace, who wrote Gibson's Oscar-winning "Braveheart" in 1995, a spokesman for the actor said. A Warner Bros. spokesman said the studio was "analyzing what to do with the project" after the latest Eszterhas script was rejected. Gibson's involvement in the film had been criticized by Jewish leaders, with the Anti-Defamation League saying it "would be a travesty to have the story of the Maccabees told by one who has no respect and sensitivity for other people’s religious views." Warner Bros.' options include hiring a new writer or shelving the project. Maccabee led a revolt against the Seleucid Empire around 160 BC and is considered one of the greatest Jewish warriors of all time and his accomplishments are celebrated on Hanukkah. News of the film's status was first reported by the website the Wrap. Photo: Mel Gibson. Credit: Kirk McKoy. More in: John Horn, Mel Gibson, Warner Bros.